If you get me in a room and we start talking about data, please forgive me if my eyes light up. You see, I confess to a certain amount of data-lust. Primarily because I believe that data is at the core of most great web applications. Secondarily, because I’m enthralled with how to move this data from a list of tables and spreadsheets and make it become real and understandable to anyone at a glance. I wrote a post about African TLDs (the suffix that country domain names go by) a couple months back. 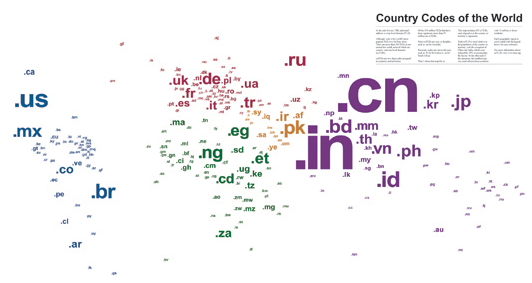 Then, today I came across this visualization in a poster of the world of country TLDs. Simple, interesting and useful. ‘Tis Conference Season… Next up FoWA and SXSW! Thanks for this post. Really timely and useful. I’ve been looking for ways to visualise some survey data I’ve got to analyse this week (I can’t stand looking at another graph from MS Excel) and so I shall have an explore of some of the visualisations you point to here. I’ve certainly found the role of visualisation in finding new ways to think about and interrogate data to be very useful indeed. I’m not quite as excited by data as you seem to be, but the timing of your Blog post follows on neatly from an email I got in the week from some friends at Tactical Tech (I’ve been helping them develop a Mobile Advocacy Toolkit). Basically, ‘Visualizing Information for Advocacy: An Introduction to Information Design’ is a manual aimed at helping NGOs and advocates strengthen their campaigns and projects through communicating vital information with greater impact. This project aims to raise awareness, introduce concepts, and promote good practice in information design â€“ a powerful tool for advocacy, outreach, research, organization and education. I’ll admit I feel the same way as you do here – mainly your second point on making it real and understandable. Thanks for this info, it will be great to have a look at! @Ken – Great links for Tactical Tech. I remember hearing about one of those booklets coming out while in Istanbul, but had forgotten already… Anyway, I’ve added a link to their site and am perusing the advocacy booklet now. Very cool stuff! @Nathan, I’ve added your blog to the resource list. I spent way to long on it yesterday reading all your analysis and enjoying the visuals. Keep it up! @Josh – I think that’s an excellent idea. The Kenyan blogosphere would be an excellent place to start. Once all of the data is aggregated on blog, bloggers, tags, etc. you could do some really neat things. Not sure Harvard or MIT need any of my help, but would love to be part of any such project. Hi Hash – really enjoyed your post. In the same vein check out this trend graph for the polls on Obama vs. Hillary vs. Edwards — you will find it very interesting.